SnapeUmp is ready for another season of Hotties! Welcome to Season 5 of the Slytherin Hottie League. We've seen 166 hotties compete for the title of Slytherin Hottest Hottie. Only 4 have had the title bestowed upon them, Severus Snape (Alan Rickman), Nathan Fillion, Hugh Jackman, and Robert Downey Jr. This term we are shaking things up. This term's nominations will have a bit of a twist, only hotties that did not compete in last term's SHL will be eligible to compete this term. as always, past winners cannot compete. 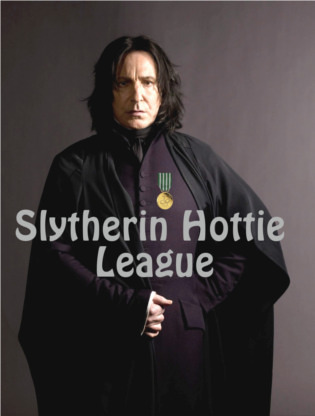 So dust off those forgotten hotties or delve for new ones and nominate them for the Fall 2013 season of the Slytherin Hottie League. Nominate Hotties Here!!! by 23:59POT on Wednesday September 18th.